We are so happy that you found us! Fru Valborg is a small company consisting me, Petra, the dyer and maker of all yarny projects and my husband Robert who helps me with pretty much everything else! Fru Valborg means "Mrs Valborg" who was my grandma that also worked with textile handicraft, the name is a dedication to her. 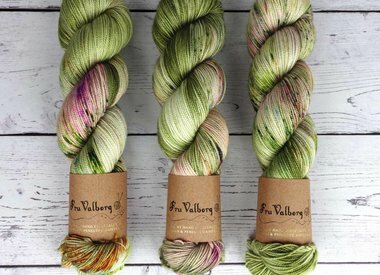 Here you will find our own artisan hand-dyed yarn, Fru Valborg. We bring all our love and attention to our hand dyeing process and every skein is unique.